Everyone up for a little Mom ranting? I have some. Ok, I have a lot. Feel free to ignore this one...sometimes I get carried away. The other day I was reading an article in Marie Claire magazine about a controversial book on motherhood being released later this month called The Conflict by French philosopher Elisabeth Badinter. 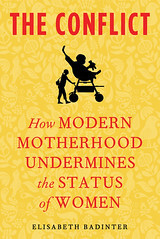 In her book, she writes that the things we consider to be key elements of motherhood and parenting (attachment parenting, baby wearing, home made baby food, breastfeeding, the list goes on) have limited us as women. That we lose ourselves in the process. That these things tether us to the home. Um. Ya. The article included an interview with Elisabeth, and gave a great deal of insight into her position. Some points I thought were actually ok, such as, "homemade baby food is terrific...but why demonize commercial baby food, which is balanced, quick, and accessible to fathers?" whereas other points...not so much. For example, while Elisabeth admits to the known benefits of breastfeeding, she seems to feel that women should forgo breastfeeding (or drastically shorten it's duration) in order to maintain their freedom, and for their marriages to survive. Now, granted, it's a huge change for couples, the first year or two of parenthood. But in my opinion, the health of the child should always be number one. So whatever you feel that is, whether it be breast or bottle, the decision should be made with the child in mind. Period. (Note, I am NOT anti-formula whatsoever. But I don't like being made to feel guilty because I chose to go another way and nurse my son.) Also, I would like to know just how many divorces cite "My wife breastfed" as the reason for the split. There are many other points made, including the fact that we must "be able to survive without a man" and her concern about "the effects of the long-term fusion between a mother and child beyond the first few months", but the general feel of the article was that as women, we have lost ourselves to motherhood and have reduced ourselves to animals (yes, she says animal). Huh. Well, I will say that there are portions of this that I feel are important to think about. While I get her point about dependency in a relationship, I also think that making decisions as a family are very different from 'being dependant on a man'. Also, I agree that women need to hold on to a part of themselves that is just their own, that we should be independent, and stay true to who we are. That we are more than just mothers, that we are well-rounded people with interests and views and that all of these things need to be fostered. But...I also think we can devote a HUGE portion of ourselves to being mothers, without losing the rest. It can be done. It's being done all the time. As I thought about everything I had been reading, and after the annoyance had subsided, I thought that there are women out there that I see, everyday, who are mothers, AND who are doing what it takes to stay true to themselves. They are wives, friends, bloggers, shop owners, designers, writers, musicians, artists, teachers...AND mothers. THESE are the modern mothers, the women who are smart and strong and brave enough to take on the role of being a mom, but refuse to 'lose themselves' in the process. They merge it all together and are living the lives they were meant to live! I thought about all of these ladies that I admire, and I felt inspired. I guess my point here is that I would like to say thank you, to all of those women, including of course my Mom, Billy's Mom, our friends, family, bloggers that I follow, people I look up to...for inspiring me to be a good Mom, and to not be afraid to stay true to who I am while simultaneously devoting my life to being Benjamin's Mom. And thank you to Billy, my sweet husband, for supporting my decision to breastfeed my son without waving the divorce flag! And for letting me spend so much of my time doing what I need to do to stay true to who I am. Be it painting, redecorating the house (againnn) or watching television shows that are clearly made for people much younger than me. Thank you babe. You're my favourite. Alright. That's enough of me and my soapbox. Sorry friends! I never read the book either but I'm slightly irritated just hearing about it! I breastfed for a year, I have only ever fed J home made baby food, I baby wore, and worked, and made alone time for my husband and I and worked out. And I don't feel like I lost myself, or that I tetherd myself to the home. That's effing ridiculous! I choose to be a mother, in every aspect of the word. And I am proud of that. I wouldn't want it any other way. Being a mom changes you fundamentally. It is reality. And it is a change I would like to think most mothers are aware of before embarking on the journey, and one that they embrace. I find the author's overly generalized viewpoint to be both naive and ignorant. And also offensive. Perhaps she should never have become a mom in the first place, if she feels its such a massive burden. Well.....I hardly know where to start. Motherhood affects people in very different ways obviously and this person's views are a testament to that. I nursed for about 8 months, made homemade baby food, used a snugli, and cloth diapers. It just never occurred to me to do otherwise. In those days, I was kinda poor (lol) and disposable diapers and store bought food were expensive. And, as far as I know, fathers can open a jar of baby food, or feed a baby with a bottle of breast-milk, or even make the homemade baby food....it's been known to happen. Dads can change diapers, toilet train, snuggle, you name it. It is probably an even bigger learning curve for them. And I always found that breastfeeding was, in a way, liberating. You can do it anytime, anywhere.....you aren't jiggling a screaming baby at 2 am trying to warm up a bottle. That's an immense amount of freedom as far as I'm concerned. The effects of long term fusion - maybe I am misinterpreting this phrase but "long term fusion" seems like a good thing to me. It lasts well into adulthood - I know that from personal experience. You are, or should be, a different person when you become a mother. Your priorities change completely - you think more about things like babysitters, regularity of bowel movements, you enjoy simpler things like a giggle and bedtime routines. BUT it doesn't make you any less of an independent woman, a wife, a girlfriend, a confidante, a best friend, etc.....rather in enhances every single component of who you are. I love this last sentence! so true.